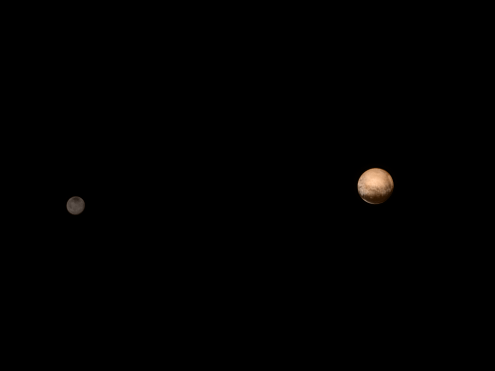 NASA’s New Horizons probe is flying past Pluto today, after years of travel. 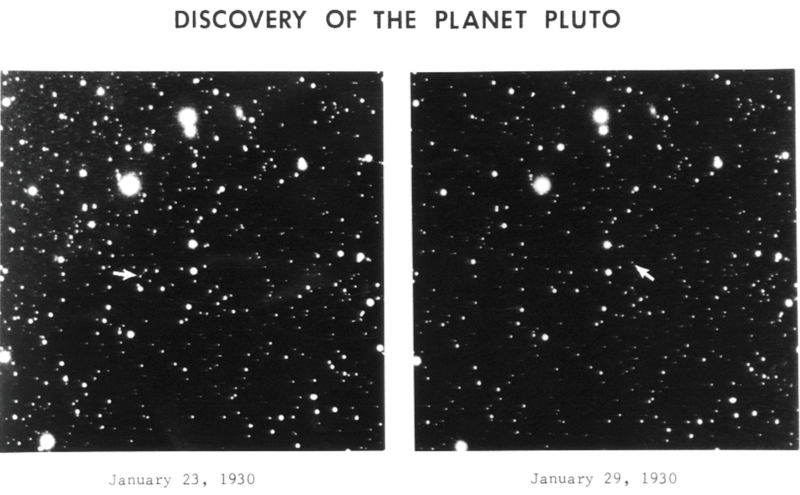 It is the first ever probe to visit the Pluto system. Here, Minna Orvokki Nygren (UCL Science & Technology Studies) describes a unique art-science collaboration commissioned by UCL & Birkbeck’s Centre for Planetary Sciences to celebrate the event. Pluto and Charon – A Planetary Waltz was composed in collaboration between composers Catherine Kontz and Minna Orvokki Nygren. The work was commissioned by the Centre for Planetary Sciences UCL/Birkbeck (CPS) and it received its premiere on the 24th of June 2015 at An Evening with the Planets event at the UCL by pianists Valentina Pravodelov and Kerry Yong. The main organiser of the event, Professor Steve Miller’s support and enthusiasm towards the project were crucial in realising this new work. 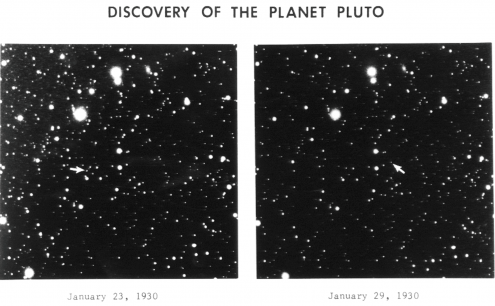 The piece was inspired by two photographic plates that led to the discovery of Pluto in 1930 by amateur astronomer Clyde W. Tombaugh. These plates were used to devise the overall form for the musical work. The distance the bodies travelled across the sky and their relation to other bodies was reflected in the music. When seemingly further away from other celestial bodies, the warped “waltz” of Pluto and Charon, written in 5/4 time, takes over with its prominent bass line and thick chords. A key aspect of the composition is its gestural dimension which the pianists take on during performance, such as switching seats with each other as in an “orbital ballet,” or the use of custom planetary mallets applied to the piano interior marking off specific movements in the piece. Other features, such as the size, temperature, consistency and albedo of the bodies were also part of the compositional process. The dwarf planet Pluto being approximately twice the size of Charon is given a more powerful and majestic voice in the work, while its counterpart Charon’s music is lighter, slower and mysterious. The Kuiper belt’s chilly conditions are reflected in the piece by combining extremely high and low pitches of the piano, and giving them an ethereal resonance through the use of distinct pedalling. An illustrated score of Pluto and Charon was created to give the audience an opportunity to follow the movement of the bodies and the musical piece. A century and a half ago, Britain was swept by dino-mania. The discoveries of ancient fossils and the first characterisations of dinosaur species, combined with new scientific theories that posited that the Earth was far older than previously thought, fuelled a fascination with all things ancient. A naïve view of these is that they are a quaint, even amusing, example of how ignorant the Victorian scientists were – the statues predate Darwin’s theory of evolution by five years, and in some cases they bear little resemblance to the animals they claim to represent. Joe Cain (professor of history and philosophy of biology in UCL Science and Technology Studies) has studied the statues’ history and says that naïve view is nonsense. The scientific origins of these statues is far more nuanced and interesting – and in any case, the credit for them lies with the sculptor, Benjamin Waterhouse Hawkins, far more than it does with the zoologist Richard Owen, who supposedly directed their design. Hawkins was a scientific illustrator, an experienced translator of scientific ideas. Owen was just one of several sources he consulted, and Hawkins kept up with the rapidly expanding literature of the animals he was working to model for his displays. Hawkins even represented competing theories of reconstruction in his statues. There are two Iguanodon statues, for instance. One is long, low and lizard-like; the other is stocky and raised on its four legs, more like a hippopotamus or rhinoceros. There is plenty to show that the artist wasn’t merely doing what he was told, but was actively interpreting the scientific evidence. There also is plenty that science didn’t (or, couldn’t) tell him. Even more than today, the Victorians had only partial specimens, made of various bones of various origins and in various conditions, leaving Hawkins to fill very large gaps. On top of this, Hawkins had to invent elements such as pose, movement, and facial expressions. None of these could be gleaned even from perfectly preserved and well-understood fossils. Given the uncertain (and disputed) scientific theories, the limited selection of fossils to work from, and the inevitable necessity of artistic licence, Cain thinks the dinosaur statues are something to admire rather than ridicule. …others, such as his plesiosaur, are remarkably similar to what we have now. 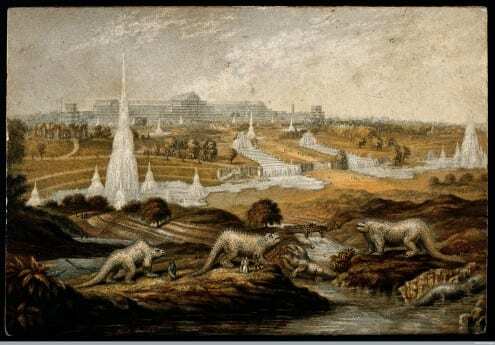 Cain’s interpretation of how the Crystal Palace Dinosaurs came about rings very true to me. In a previous life I worked with some of the people who prepare scientific visualisations, animations and artists’ impressions for the Hubble Space Telescope. The case of HD 189733b – a planet that was observed being scorched by a stellar flare (among other research) – is remarkably similar to the dinosaurs of Crystal Palace. Much like Benjamin Waterhouse Hawkins, those animators had a great deal of scientific information they could draw on – on the size and brightness of the flare, on the optical properties of the atmosphere, on the colour of the star and its appearance. But as with the Crystal Palace Dinosaurs, these were just pieces of a puzzle, with plenty missing and some educated guesswork involved in putting them together. The resulting animations are rather beautiful, and like with the dinosaurs, the artist deserves at least as much credit as the scientist does. 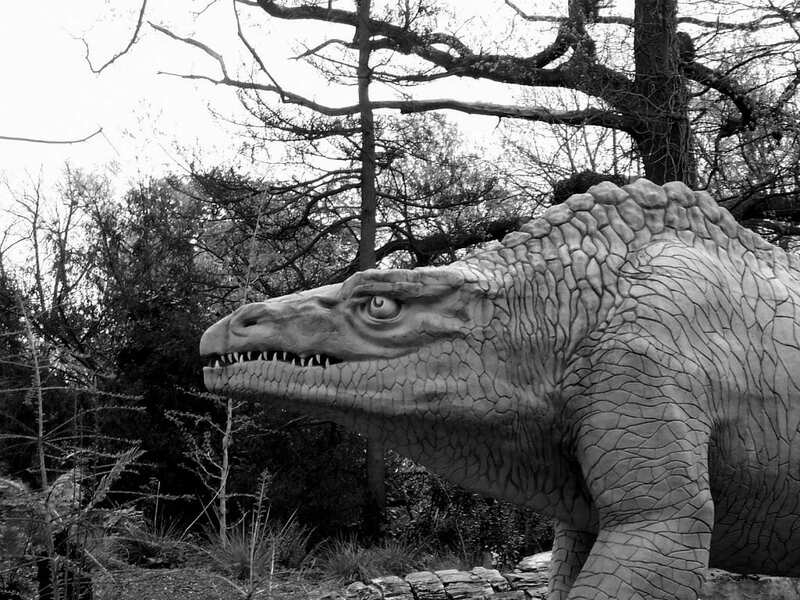 The Friends of Crystal Palace Dinosaurs website has extensive information on the dinosaurs, where to visit them and the campaign to conserve them. Joe Cain is one of the leading members of the Friends, and sits on the group’s management board.